Rugby Town’s United Counties League pursuits continue over the next week with a Butlin Road doubleheader, when first Newport Pagnell and then Northampton ON Chenecks visit on Saturday and Tuesday respectively. 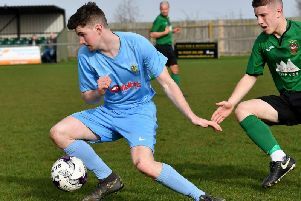 Valley have edged up to sixth spot in the Premier Division table following their 1-0 win at Eynesbury last weekend - a result which ended a three-game losing streak for Carl Adams’s men. Following the third of these defeats last Tuesday in the League Cup against Leicester Nirvana, Adams had asked for a positive reaction from his squad. Whilst Town’s performance at Eynesbury was far from their best, they did at least show they can dig in and - in the words of Adams - “win ugly” inflicting only a second league defeat on a side that had gone into the game in third place. Adams had also hinted that there could be new arrivals imminently to keep his current players on their toes, and the first of these was the delivered with the signing of defender Liam Francis. Francis, 28, had been set to start the season at Butlin Road and therefore join up with his old Stratford boss Adams, but had a change of heart and decided to stay at Knights Lane instead. He subsequently left there to sign for Redditch and played against Rugby in the recent FA Cup clash between the two sides, which Valley famously came from behind to win 4-2 with ten men. Francis was an unused substitute at Eynesbury on Saturday, but Adams may give the experienced player a first taste of action against the Swans this weekend - especially considering two other senior squad members Justin Marsden and Richard Bunting are both struggling with muscular injuries. Saturday’s opponents currently have three players that have featured for Rugby in recent times in Fazel Koriya, Stuart Smeathers and Tom Liversedge. Koriya was a popular figure in two spells at Town - scoring 15 times in 46 starts, and was actually a target of Adams in his pre-season recruitment activities. Smeathers played twice under Billy Jeffrey in 2005, with Liversedge on board for the first month of the 2015/16 campaign. Liversedge scored in Pagnell’s weekend home victory over Boston to end the Buckinghamshire club’s run of four games without a win, and they currently sit in 13th place. Saturday’s match marks to the day the 45th anniversary of Valley’s first-ever game at Butlin Road, when Burton Park Wanderers were the visitors. This inaugural encounter - which ended goal-less - was also played out in the United Counties League in a season which saw Tuesday evening’s opponents Chenecks feature at Butlin Road too - in one of eleven games between them in that era of the club’s history. The Northampton club were formed in 1946 to enable boys from the local (rugby playing) grammar school to participate in competitive football, and were initially known as Old Northamptonian Chenecks - with the ending of the entity formed from an amalgamation of the four school house names. Following these upcoming league outings, Rugby are back in knock-out action next Saturday (13th) when they travel to MFL Premier Division Boldmere St Michaels in the First Round Proper of the FA Vase.